Since the first impression always counts, appealing, eye-grabbing front doors offer a way to welcome your guests in style. 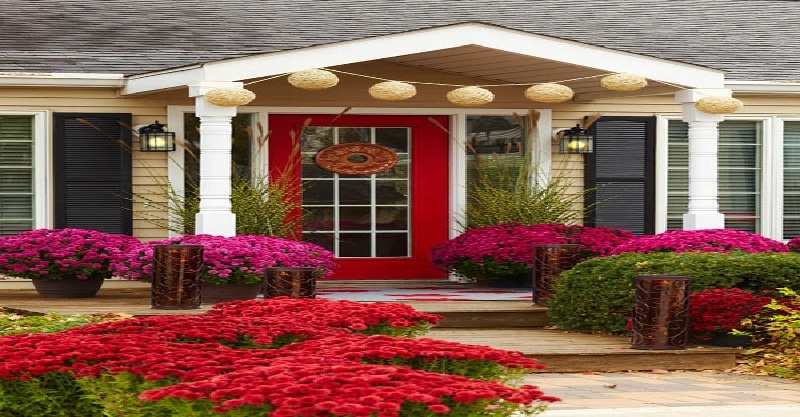 Whether in a bold, unexpected color, of eye-grabbing design, or beautifully embellished in one way or another, front doors are an option to add interest and curb appeal. Furthermore, well-designed walkways or stairways and statement front doors work well together to make any home feel inviting. In addition, when it comes to truly stunning front door designs/such as a carved wood front door/, the door is usually complemented by columns. The combo definitely makes a focal point and lends a unique look to the whole exterior. For a balanced, symmetrical look, frame the front door with a pair of matching sconces, lanterns, or planters. Undeniably, this approach can take any entrance to the next level. Note that front door mats, knockers, handles, knobs, and bells, as well as house numbers are an easy, affordable way to enhance the exterior look. As they reduce energy costs and can add some extra style, consider adding a screen/storm/ door. Front door overhangs/awnings or porticos/ add extra visual and architectural interest and character. Generally, front doors/whether of traditional or modern design/ are an option to both express the owners’ taste and add personality to any property. In this regard, an array of simple, affordable DIY projects can be useful. After all, even a coat of paint in a bold color can make the front door stand out. Although there are no strict rules, some colors, such as grays, browns, and blacks, are regarded as a common, safe choice. Gray is a versatile hue, comes in a range of shades and tints, and usually works well with both traditional and modern designs. As versatile as gray, with an array of shades, tints, and tones, blues are greens are also a favorite solution. If well integrated into the overall exterior, a front door in any of these colors can grab attention and add style, elegance, and visual interest. Unquestionably, black demands attention, which makes it another popular choice. 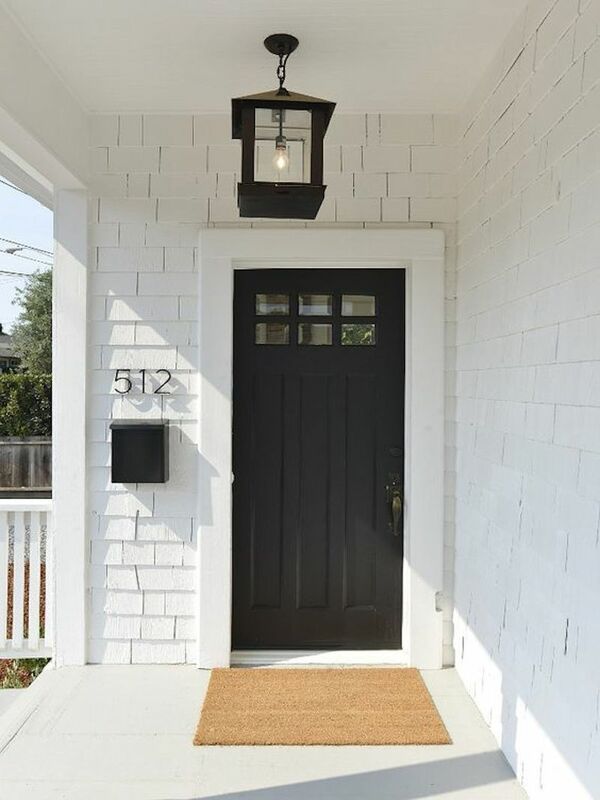 A black front door can lend a sophisticated, elegant look to any exterior. In the picture above, a black front door/complemented by a lantern, mailbox, and a street number in the same color/ stands out against the all-white exterior. A sisal door mat adds color, visual interest, and an organic feel. However, any homeowner can go bold and choose a vivid front door color to definitely make a powerful statement. Above shown is a spectacular purple front door/SW Dynamo 6841/, which unquestionably makes a bold statement against the all-white façade. 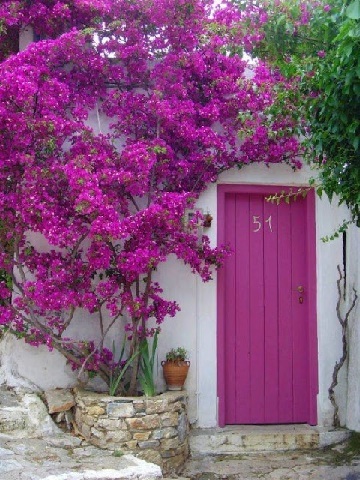 A magnificent Bougainvillea shrub beautifully complements the front door. Truly a wow-worthy exterior! Yellow is energetic color, which symbolizes sunshine, joy, and happiness. 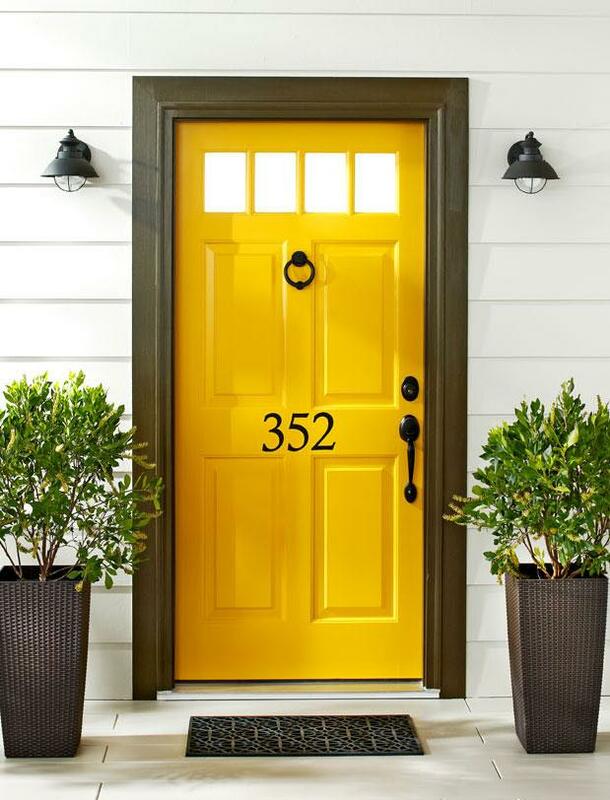 Opt for a yellow front door to definitely make a statement! Above, an appealing front door area. A golden yellow/SW6683 Bee/ front door is complemented by a dark brown trim. Industrial-style wall sconces and matching planters lend the entrance area a harmonious, unified look. In the picture above, a wow-worthy exterior. 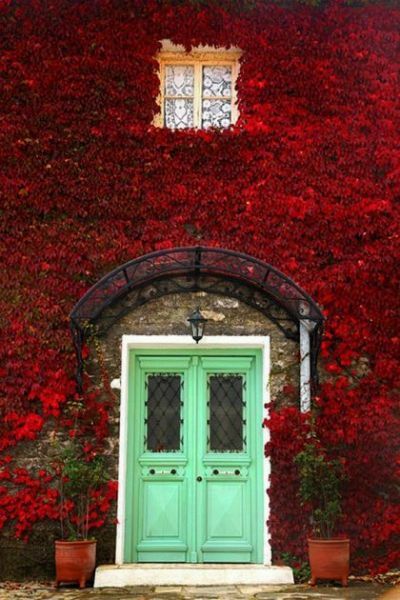 An antique green door complemented by red Bougainvillea vines definitely works well together to create this striking façade! A small window with a white curtain adds touches of whimsy to the setting! Apart from pure functionality/to protect the property against forced entry and the elements /, unquestionably, front doors can also instantly add to the appeal of any house and help create an inviting atmosphere. Furthermore, they offer another way to express the homeowners’ style and taste. As for the materials they are made from, there are some classic options, such as wood and steel. Wood works well with both traditional and contemporary designs and lends a warm, organic look. Plus, it can be painted to fit in with the exterior color scheme. Steel is an affordable option, which offers security and durability. For extra visual interest, both wood and steel doors can be with clear or decorative glass inlays of different shape, sidelights, and transoms. Frameless all- glass doors/clear or frosted/, usually custom made, are a stunning option, which lends a spectacular look to any house exterior. For a sleek, modern look, aluminum doors are another option to consider. When it comes to harsh climatic conditions, fiberglass-composite doors are a favorite choice. More durable than wood doors, fiberglass-composite doors mimic their look and lend an appealing look with touches of modernity. Arched intricately carved Mediterranean-style wood front doors, Dutch doors, Mid-century Modern front doors, rustic and copper doors, or futuristic designs, such as rotating doors, are solutions that can definitely take any house exterior to the next level. In the picture above, a black metal-and-glass front door. Elegant, stylish, and sophisticated, the design lends a timeless look to this house. Above, a wood-and-glass door of traditional design. 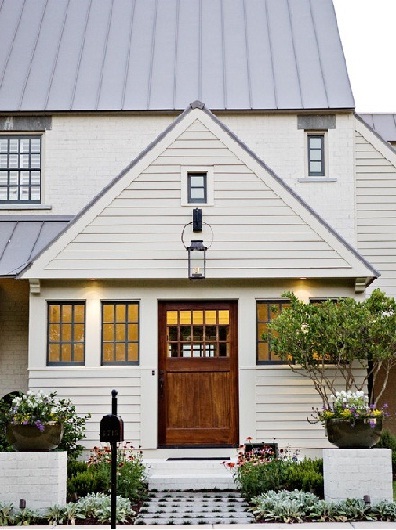 This brown door, which definitely stands out against the white façade, creates an organic feel. Coordinated windows in terms of design lend a harmonious, appealing overall look. A traditional-style lantern adds visual interest and personality. Lush vegetation brings color, scent, and charm. Above-shown, a bold, futuristic design in a vibrant color. 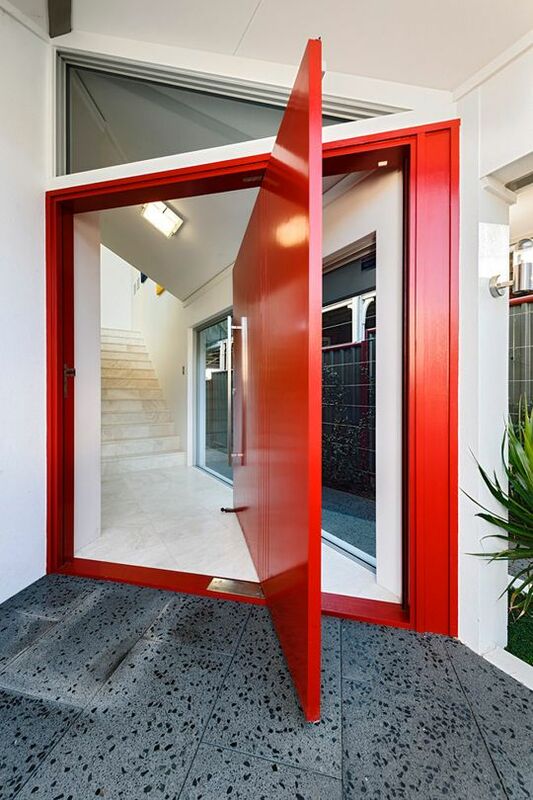 This red pivoting front door is a spectacular way to add personality and visual interest to any contemporary home. Truly impressive! 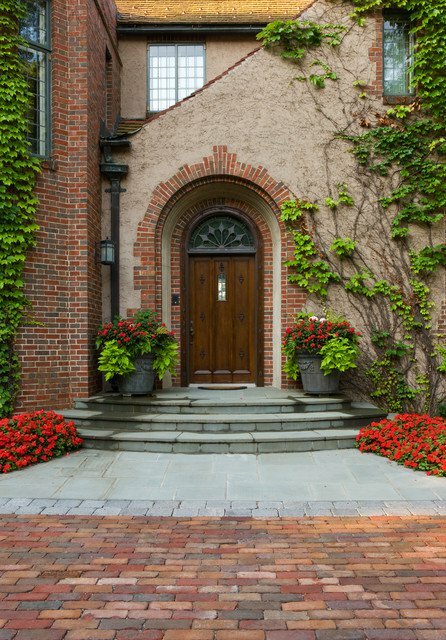 Incorporating vegetation is the easiest, simplest, and most affordable way to embellish the front entry area. Containers of different size and shape flanking the front door, hanging planters, raised beds, and climbing vines are some of the options to include foliage. Highlighting/with paint or landscape lighting/ architectural details, such as arches, columns, trims, cornices, roof eaves, or niches, is another way to beautify any house exterior. For both safety and decorative reasons, walkway, driveway, and porch lighting is also a must-have décor element. Mixing and matching materials is a smart technique that helps add color, texture, dimension, and visual interest to even a plain front façade. When it comes to front door decoration, apart from bold colors and visually interesting hardware, panels are also an option to add appeal, texture, and depth. Note that stained glass insets offer a fascinating way to embellish any front door and add style, elegance, personality and visual interest. In the picture above, an elegant traditional-style house with a stunning arched wooden door. Eye-grabbing brickwork adds architectural interest, appeal, and tons of personality. Fabulous matching planters with lush vegetation bring color and scent. Climbing vines add touches of charm and magic. Definitely an intriguing exterior! Above shown, a stunning classic paneled front door with a transom. Architectural details and matching lanterns and planters lend an appealing, harmonious, balanced look. Vegetation and lighting along the walkway add to the curb appeal. Unquestionably, an impressive exterior! Whether brightly painted or not, single or double, made from solid wood, wood panels, metal, glass, or combos of two materials, of traditional or contemporary design, of clean, geometric lines or intricately ornate, front doors are usually the focal point of the house exteriors. Plus, as they are an opportunity to make a great first impression, grab the chance and turn your front door into a bold design statement!